In an unusual deal, two sisters will be released from prison as long as one donates a kidney to the other. 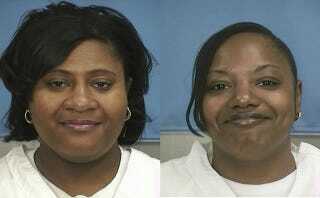 According to the AP, Jamie (left) and Gladys Scott (right) were serving life sentences for armed robbery at the Central Mississippi Correctional Facility, but Jamie required regular dialysis. The state of Mississippi decided to release her early because of her kidney condition (which may not have been entirely altruistic — her dialysis was costing the state $200,000 a year), but then her sister Gladys petitioned for early release as well, on the condition that she give Jamie one of her kidneys. The state agreed, and Gladys is set to go free too — but must donate a kidney to Jamie within a year. The case raises a number of potential problems. For starters, it hasn't been confirmed that the two women are a tissue match — though if they aren't, presumably Gladys won't go back to jail. Medical experts apparently also have "legal and ethical concerns," which is understandable. While this particular arrangement was proposed by the sisters themselves, it could set a bad precedent — what if future criminals are pressured to give up organs in exchange for release. And though the fact that the recipient in this case is a family member makes the case more palatable, it's possible to imagine future scenarios where inmates donate kidneys to more well-off people in exchange for release — which would create a disturbing power dynamic, to say the least. Still, the NAACP is cautiously in favor of the plan, acknowledging concerns but arguing that what's important now is the sisters "getting the freedom they have won, the health care they need and ultimately the full pardon they deserve." In fact, many have argued that the sisters never deserved life sentences in the first place — their robbery may have gotten them as little as $11.